This Mass celebrates our faith and hope in the promise of full communion eternally with God and his people. This is part of the Ministry of consolation for which the community is responsible. The community consoles those who have lost a loved one. We celebrate an ongoing relationship with the communion of Saints. In our Parish, we celebrate Mass for deceased parishioners. This Mass is celebrated on a Saturday in November at 6.15pm. The date for the Mass is advertised on the church notice-board and in the weekly newsletter. The Bethany Bereavement Support Group invites the families of deceased parishioners and parishioners who have suffered bereavement in the previous twelve months. 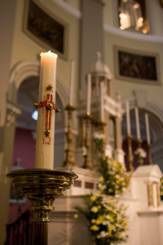 The liturgy includes the liturgy includes the lighting of a candle for each of the deceased. The community is responsible for the Ministry of Consolation and therefore the Parish community gathers in support of all of those who have been bereaved.